Azalea is the best choice for a smart price. 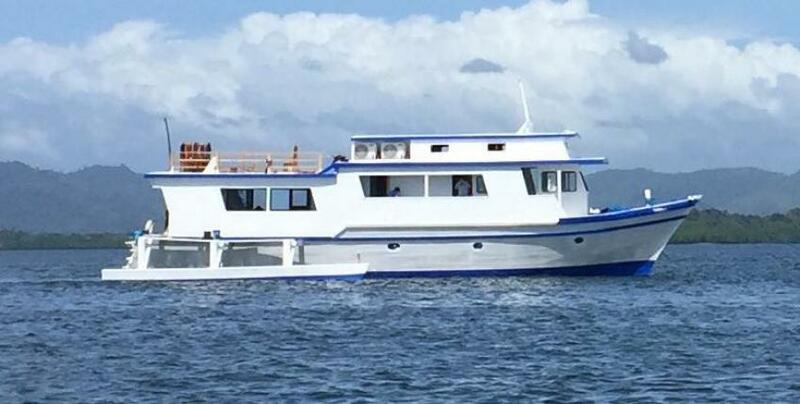 The boat can accommodate 10 guests, personal care is guaranteed. All famous diving destinations of the Philippines can be visited Tubbataha, Apo, Coron. Explore wrecks, and reach reef, meet lots of pelagic fish. Azalea has 5 cabins on board. 3 staterooms located on the lower deck. Two of them have twin bunk beds and one master cabin equipped with a double bed. Other two room are on the upper deck. All cabins are en-suite, have air conditioning so your trip will be comfortable. Boat’s guest can relax on the top deck and enjoy the view. The yacht also has a spacious diving area. The boat has all necessary safety equipment including GPS, radar, VHF radio, satellite phone, medical safety equipment, life rafts. Azalea was designed especially for divers. Special attention was paid to give our divers the best possible space for their equipment. Coron, Apo Reef and of course famous Tubbataha can be explored on board of Azalea. Coron is known for wreck diving. Each sunken ship is different with its own characteristics. And they are full of amazing artifacts. Apo Reef is the second largest reef in the world. It’s great for shark encounters and also for macro diving. Tubbataha is on the bucket list of many divers. Two atolls divided with a channel. Over 600 species can be met here. Mantas, sharks, turtles and many more. Tubbataha Reef is best to visit from March to June. The water temperature is within the range of 26-28C/85-92F. Best time for diving on Apo Reef and Coron is from November to March.